Holders Glasgow City will face Forfar Farmington in the Scottish Cup final after the two top sides in the Scottish Women's Premier League won their semis. Forfar edged out Hamilton Accies, who sit seventh in the top flight, 2-1 after extra time. Meanwhile, City defeated fourth-top Hibernian 3-0 to book their place in the final at Excelsior Stadium. The Glasgow side had hammered the same opponents 8-1 on Sunday to ensure they will retain the league title. This time, Hibs put up a stiffer resistance until striker Emma Mitchell scored with head and boot before half-time, with Jo Love adding the third after the break. City head coach Eddie Wolecki Black was delighted that another treble - Glasgow also won the League Cup - was still a distinct possibility. "We are one step away from completing yet another remarkable season," he said. "I always knew tonight's game was going to be more difficult as it always is when you play a team back to back. "I felt we were wasteful in our chances and good credit to Hibernian for putting a brave battle and they defended well. "With Hibs pushing three up late in the game, it created more space and that eventually allowed us to get the third goal." City, who reached the last 32 of the Champions League, have lost only one domestic game this season and only then after a victory over Forfar was overturned because the Glasgow side fielded an ineligible player. Forfar will therefore take to the field at Airdrie United's ground on Sunday 11 November as major underdogs despite presently sitting second in the Premier League. 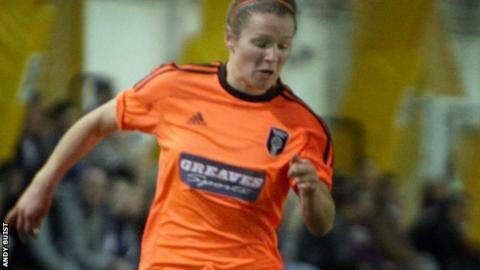 Nicky Grant scored Farmington's winner in extra-time after Lucy Graham's opener had been cancelled out by Accies' Clare Gemmell at Ravenscraig.